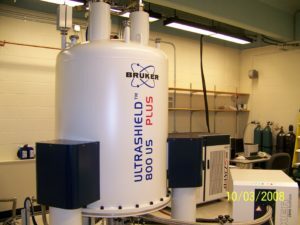 The biomolecular nuclear magnetic resonance facility at UVa is home to one 800, three 600, and two 500 MHz spectrometers, which are equipped with triple-resonance cryoprobes. A 500 MHz solid-state NMR spectrometer with a heteronuclear MAS-probe is available for solids experiments. More….